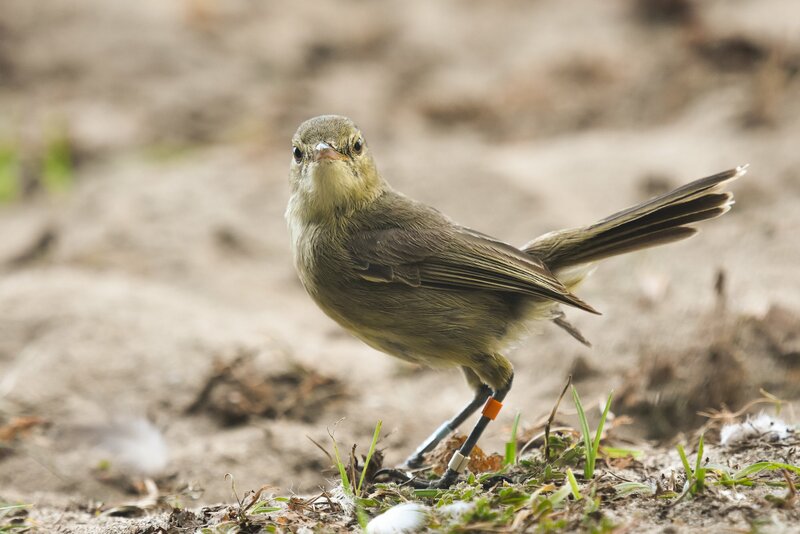 Research on the Seychelles warbler, a cooperatively breeding songbird that inhabits tiny tropical islands in the Indian Ocean, shows that older females that receive help from other females when breeding age more slowly and live longer. Intriguingly, these older females also appear to recruit more female helpers. On Cousin, an island the size of just 40 football fields (29 ha), nearly all the Seychelles warblers are individually marked with coloured leg rings. Because they almost never leave the island, these individually marked birds can be followed throughout their entire lives. Furthermore, because there is no predation on adults, most die of intrinsic causes, such as those associated with old age. The maximum recorded lifespan of a Seychelles warbler is 19 years - which is exceptional for a songbird of this size. These features make this warbler population a great system in which to study ageing under natural conditions. Importantly, although recent research has revealed many factors that influence ageing patterns in wild animals, including in the warbler, we know very little about how ageing is affected by an individual’s social environment. For example, does cooperation reduce the costs of finding food or raising offspring, and thus delay the onset and rate of senescence? Cousin Island is a nature reserve managed by Nature Seychelles. Undertaking fieldwork on the island is a privilege as it is a truly spectacular place! As well as various rare songbirds, the island is covered with over 300,000 nesting seabirds (a good hat is a must!) that do not fear humans. There are also giant tortoises and millipedes, lizards galore, sea turtles and, sometimes, a few too many mosquitoes! Staying at the field station is a superb experience with a stimulating mix of local wardens, visiting researchers and volunteers. The Seychelles warbler’s cooperative breeding is a fascinating aspect of its behaviour. Warbler territories - which are defended year around - often contain not only the dominant breeding pair but also extra subordinate adult individuals. These subordinates are often grown-up offspring that have, as yet, been unable to find a breeding position of their own elsewhere on this saturated island. Because breeding positions only become available when a dominant breeder dies, factors that improve the survival of dominants will lead to younger birds having to stay as subordinates for longer. These subordinates, especially the females, often help the dominant pair defend the territory and raise offspring. However, some of these females also manage to co-breed with the dominant female by laying an egg in the nest. 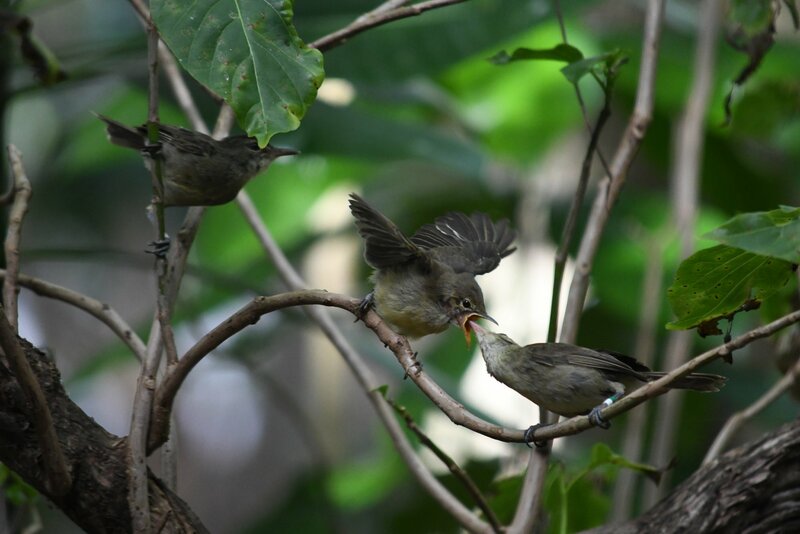 Importantly, in many cooperatively breeding species (including the Seychelles warbler), help with parental care enables the dominant breeding pair to reduce the effort they have to spend on raising their offspring. These resources may then be redirected to improve their own condition, which may alleviate senescence. 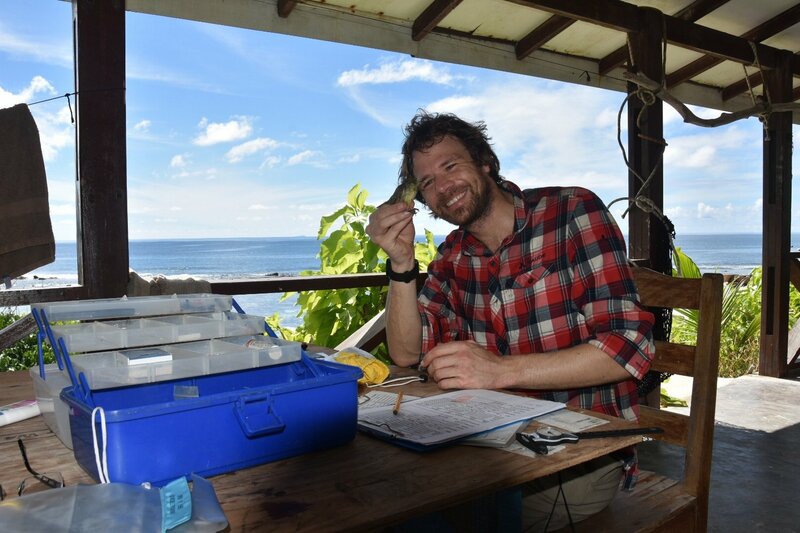 Our study in Nature Communications shows that in the Seychelles warbler the decline in survival that is normally observed in older individuals was greatly reduced in dominant females that received help with parental care. Furthermore, in dominant females the rate of telomere shortening – a useful marker of biological condition and ageing in the warbler and other species – was reduced in females that had help compared to those that did not. Finally, older dominant females were more likely to have female helpers. Together, these results suggest that helpers alleviate senescence in breeders and that older individuals may, in some way, encourage higher levels of helping. In the longer term, improvements in the late-life survival of dominants as a result of helping may drive the evolution of longer lifespan in cooperative breeders, but this prediction remains to be tested. Future studies should explore the possibility that cooperation and delayed senescence are positively self-reinforcing, which may explain why individuals in species with highly social breeding systems often have relatively long lifespans compared to those in less social species.